Cocoa and Chocolate's History and Packaging | Canfab Packaging Inc. Known as “the food of the gods”, chocolate’s history dates as far back as 2,000 years B.C.E when early Mesoamericans fermented a bitter drink made from cacao seed, chili, mustard, and honey. Thought to have brought strength to the early Mayans and Aztecs before battle, similar drinks called chilates are still consumed today in southern Mexico. It wasn’t until the 16th century, when cocoa first arrived in Europe, that the chocolate craze really took-off. Combined with sugar and thickening agents, cocoa was served to the French and Spanish noble classes in both powdered-liquid and bonbon formats. Today, most of the world’s cocoa is produced in West African countries like Côte d’Ivoire. Other Central and South American countries account for the balance of the world’s production. Cocoa seeds, like coffee beans, are a highly traded commodity and one of the world’s most valuable cash crops. Cocoa’s main spin-off product, chocolate, has become ubiquitous, available in an unending variety of formats, enjoyed by all, in every corner of the planet. Where do composite cans and cocoa intersect in this sweet tale? As mentioned, the original crushed cocoa seed from so many centuries ago still exists today. 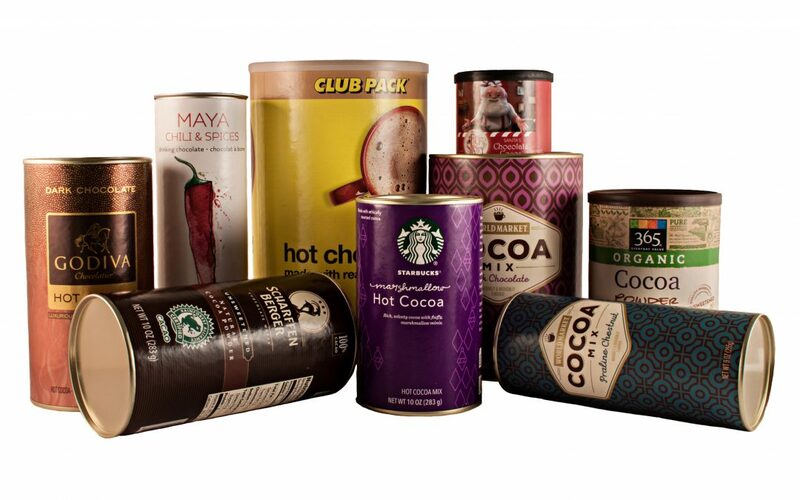 Mostly used in desserts and hot chocolate, powered cocoa is preferably packaging in composite cans. From iconic chocolate companies like Godiva and Ghirardelli to well-known consumer brands like Nestlé, Cadbury, and Carnation, many companies use composite cans because of their practicality, durability, and marketing punch. For chocolate powders, chips, or chunks, composite cans are today’s go-to packaging solution. Canfab has more than eighty years’ experience in partnering with some of the best and most recognized chocolate brands in the food industry. Let us help you choose the perfect solution to make your product stand out. Visit our website or call us toll free today at 1-888-5-CANFAB for more information about using composite cans for your products.